Seven simple ingredients are all that is in this recipe and it is so easy to put together! 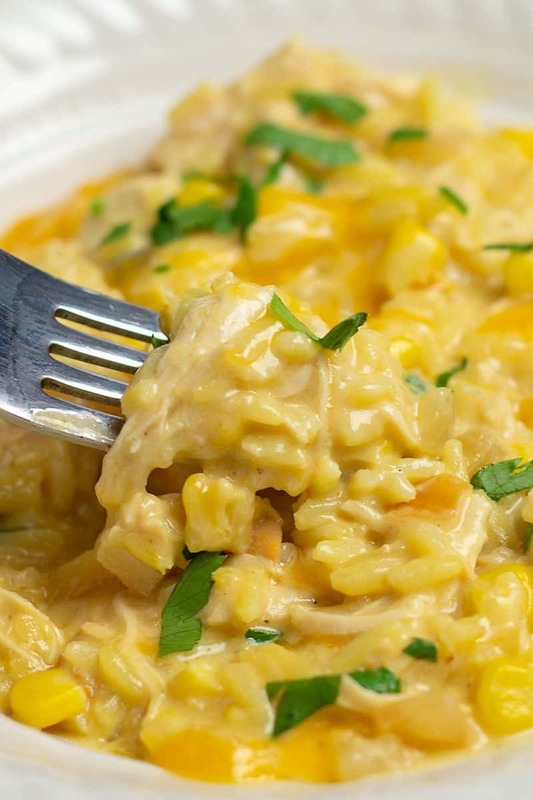 My family really enjoyed this Crock-Pot Cheesy Chicken and Yellow Rice dish and I will definitely be adding it to our meal rotation. Any time I get a thumbs up from my kiddos about dinner, it’s a must to make again and again. What makes this chicken and rice recipe so much better than others is the addition of the yellow rice instead of regular white rice. I’d never had yellow rice before, and when shopping for the ingredients all I found was the Zatarain’s brand of yellow rice. I took a little bite of the rice after I cooked it in the microwave, and yes, yellow rice is tasty! After I tasted the rice, I had to google yellow rice to find out how it was made (of course, lol.) I did find a few recipes that sounded good, so maybe someday I will attempt a huge batch from scratch and then freeze it…but that my friends, is a task for another day! 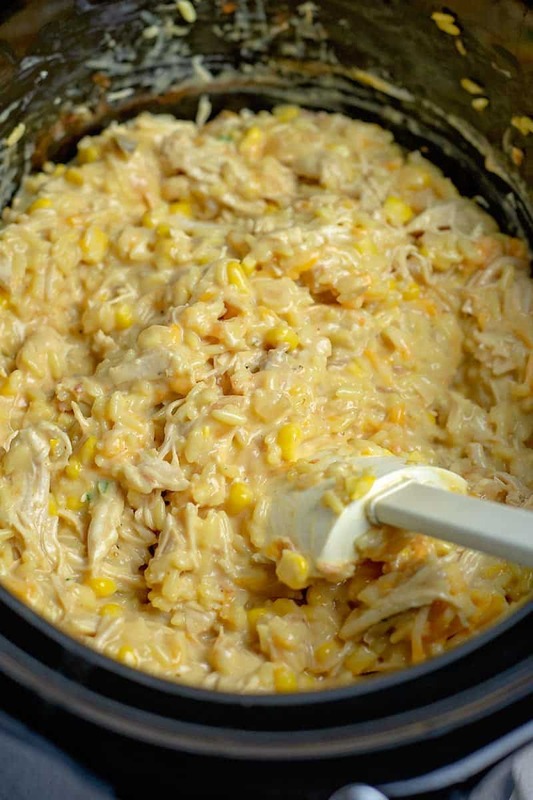 How do you make cheesy chicken and rice in a crock pot? What makes this recipe so easy is this is almost what I call a “dump dinner.” Just toss in a few ingredients into the slow cooker and when done, shred the chicken and stir in the last few ingredients. This recipe does use canned cream of chicken soup, but if you are bothered by that, look into the Pacific Foods Organic Cream of Chicken Condensed Soup. It’s more expensive, but they steer clear of steer clear of additives, preservatives and common allergens, and avoid GMOs. 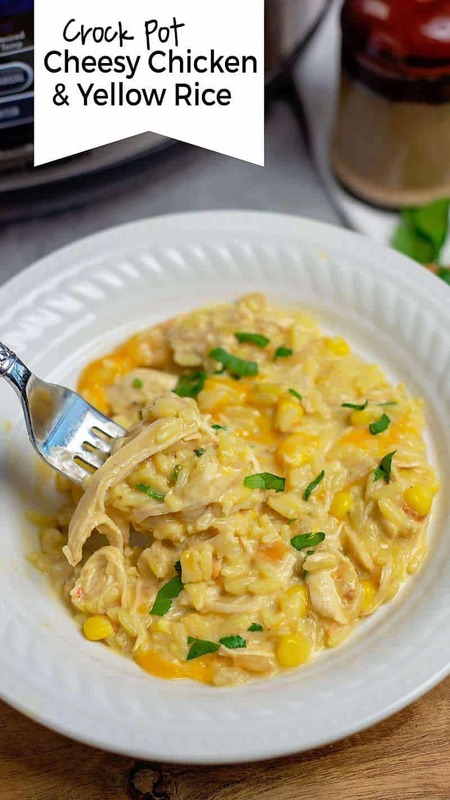 Use your crock-pot for good this season and create this cheesy chicken and rice crock-pot recipe! Trust me…your taste buds will thank you. 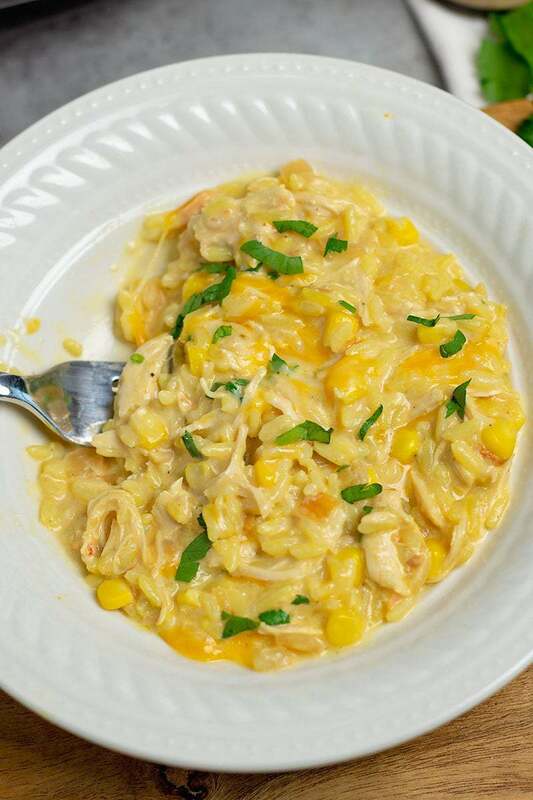 Crock Pot Cheesy Chicken and Yellow Rice is a fabulously filling and hearty dish the family will love! Place the chicken breasts in the crock pot. Add the chopped onion and spoon the soup on top of the chicken. Cook on low 7 to 8 hours or high 3 to 4 hours. At the end of the cooking time, open the crock pot and break the chicken up into small pieces. Add the rice, cheese corn and sour cream to the crock pot. Stir until all combined. Put the lid back on and allow the crock pot to cook for about 10 to 15 more minutes or until everything is warm and the cheese has melted. Garnish with a sprinkle of cheese and fresh parsley. This looks so delicious! I absolutely LOVE crockpot meals and I am excited to add this one to my menu! Thank you! This recipe is delicious! It's one of my favorite Pinterest finds. To make it a little healthier I have added frozen mixed veggies instead of just corn and changed the yellow rice to brown or wild rice! The yellow rice is awesome too though:) It's a great easy weeknight meal when I know that I won't have time to make dinner. Whoever invented the crockpot deserves a big fat hug! Hey! Dropping in from the SomewhatSimple link-up. Yellow rice was a childhood favorite of mine! The recipe looks fantastic and so easy to put together. Thank you so much for sharing! This looks really good and very family friendly! I have to pin this for the upcoming school year when I will be relying heavily on my crockpot! This looks delish! is there something substitute for the sour cream though? No one is the house will eat sour cream! even better then I don't need to run to the store 🙂 Thank you! 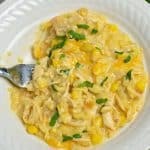 I love this recipe, but have never tried it in the crock pot! So glad! Have a great weekend! This looks so stinkin' amazing! Thanks for sharing! That looks so good and this sure is the summer for using the crockpot! Thanks for sharing! Sounds yummy! Speaking of yellow rice, my mom and aunt used to make a stir fried rice dish using yellow rice. I need to look for that recipe. I'm always looking for a good crock pot meal, especially ones that involve chicken. Thanks for the recipe! Always looking for new crock put recipes (I have a baby and a toddler so easy is a pre-req!) and this looks delish! This sounds delicious! And I bet my 1 year old would love it :o) Stopping by from Tatertots and Jello and pinning it now!! O it looks so yummy! LOVE crock pot meals, thanks girl! Tell me Tuesday link party. yummo! Would love to have you link up to our party! That looks amazing! I think even my picky eaters would eat this. Thanks for sharing. Visiting from Someday Crafts. Yum, I agree with a commenter above, my picky eater would love this! Thanks for sharing. Hey great slow cooker dish! This week's Food on Friday on Carole's Chatter is all about collecting up slow cooker/crockpot recipes. It would be great if you linked this in. This is the link . Have a good week. yummy….its looking delicious …can't wait to try this..!! I ended up subbing the sour cream for yogurt. We loved it thanks for the recipe. Hi! Wondering how I could turn this recipe into a freezer meal to dump in the crock pot to day of if possible? Hmmm… I guess you could freeze the onion and chicken, but I would just open the can of soup and add it when tossing everything in. I think if you tried to add the rice too early it might be mushy and the sour cream and cheese would curdle/separate if added at the beginning. Hi, This looks awesome! I was wondering if this could be turned into an instant pot recipe? I bet that would be yummy!